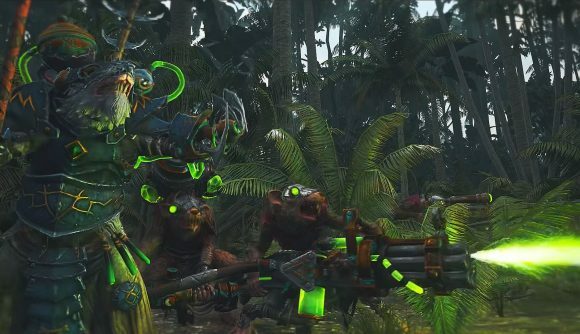 It wasn’t long after the release of the trailer for Total War: Warhammer 2’s coming DLC, the Prophet and the Warlock, that fans noticed its clear inspiration: the scene in the iconic ’80s action movie Predator in which a panicked Mac Eliot takes a minigun to the Val Verdean jungle. What you may not have noticed is just how closely the trailer matches the source material. It’s not just about the ratling gunner who fires blindly into the forest – it’s pretty much shot-for-shot, as the side-by-side comparison below demonstrates. There’s a Skaven who stands in for Blain Cooper, the original wielder of the minigun (aka, Old Painless), and a skink who doubles for the Predator who slays him. Ikit Claw, one of the two stars of the DLC, is Schwarzenegger’s Major ‘Dutch’ Schaefer, and a trio of Jezzail sniper teams replace the other mercenaries in his crew. The trailer only differs from the movie when a Lizardmen army emerges from the jungle, led by the red-crested skink and Prophet of Sotek, Tehenhauin, atop a Stegadon. That would’ve been a very different movie. It’s an excellent showcase for the DLC’s new units, chiefly the ratling gunner who stars, but also the Jezzails and the Doomflayers (the scythed motorbikes). On the Lizardmen side, the Salamanders (bright orange lizards) and Ripperdactyls (sharp-beaked flying dinosaurs) are also welcome additions. Wonder how they’d fare against the Predator – surely that’s a mod waiting to happen. The Prophet and the Warlock is out on April 17 – check it out on Steam here. If you pre-order it before its release, you’ll get 10% off its regular price of $8.99 (£6.99).